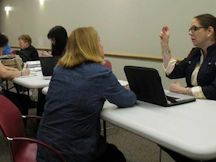 Meetings typically feature professional speakers, “Genealogy Tips and Tricks,” “Ask the Experts,” and a refreshment break. 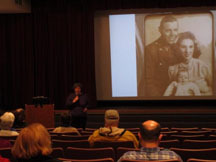 Occasionally we present a “Show and Tell” session with members sharing their genealogy experiences, ideas, and finds. 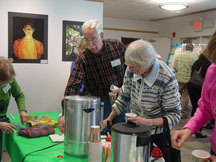 Our meetings are held at 10:00 A.M. on the third Saturday of each month, except July and August at the Bethpage Public Library. 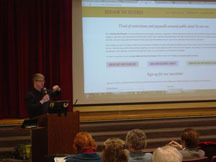 Education chairperson, Kathleen McGee, shares research tips for both new and experienced genealogists. Meet and socialize with other members. This is an opportunity to meet one-on-one with an experienced genealogist to ask a basic genealogy question. Most months we present professional speakers on various topics of interest to our members. Check our Calendar for information about upcoming meetings and events.